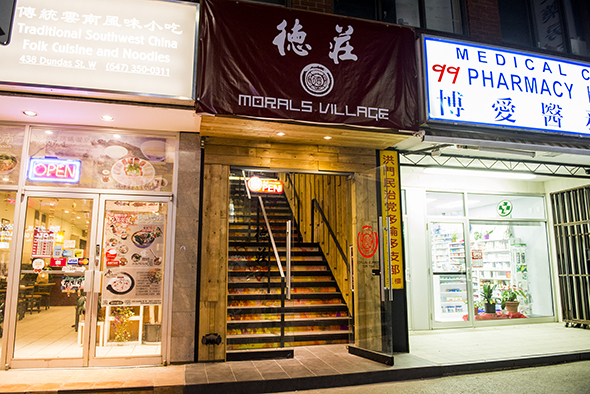 Morals Village, a hot pot restaurant chain with over 600 locations in China, has made inroads into the Toronto dining scene with its upscale vibe and premium ingredients. 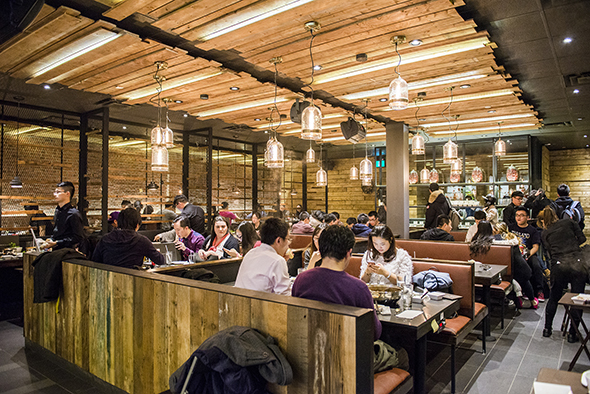 In contrast to the grandiose feel at the Markham location , the more-recently opened outpost in Chinatown feels a bit more urban hip with its exposed brick and industrial-style lighting. 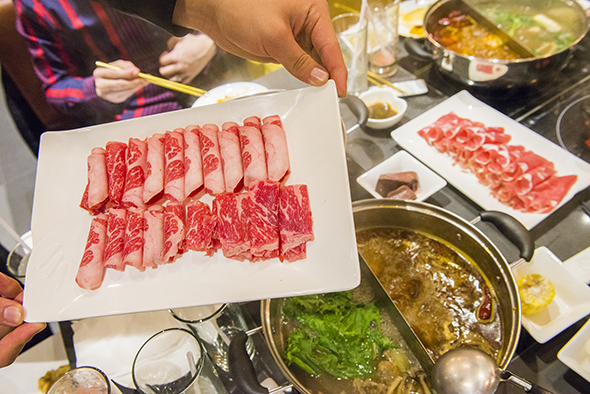 It may feel a bit cramped at times, but remember that hot pot is as much about the food as it is about socializing with fellow diners. 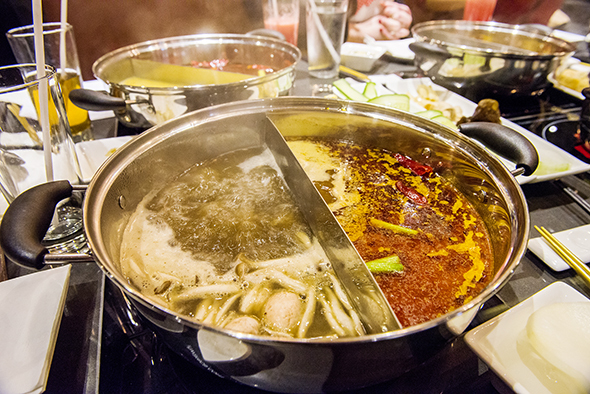 At Morals Village the hot pot is AYCE. If you're dining here on a weekday, prices start at $25.99 for adults (Weekends cost an extra $2). 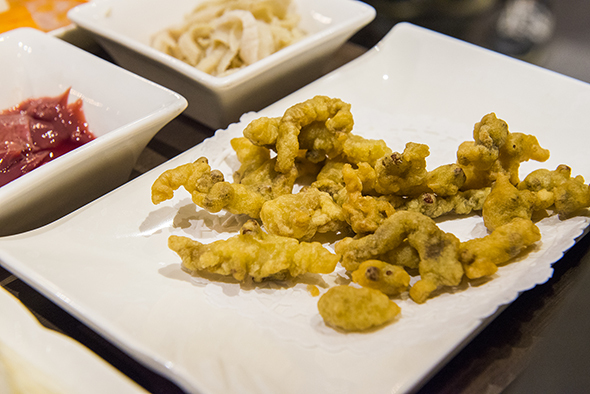 There are 12 broths to choose from and many comes with a surcharge (starting at $2.50) to the base AYCE price. The 10-year Special Spicy Soupbase (+$8) is the house special. It's indeed very spicy and therefore probably not for the faint of heart. Alternatively, you can try the surprisingly delicious French-Inspired Sweet Corn Broth (+$3). It's smooth and sweet, as the name suggests, and the corn flavour isn't overpowering. You can also try both broths simultaneously with a half-and-half pot to get a contrasting experience. While you can opt to pay extra for special add-ons, there are many tasty ingredients that are already included with the base price. The lamb, for instance, is tender and thinly sliced while the wide varieties of fish balls and sausages nicely complement the meal. Pork fillets are also available at no extra cost. These delicious morsels contain special Chinese herbs that, after an initial delay, will start to make your tongue feel numb and tingly, reminiscent of the aftereffects of Pop-Rocks candy. Definitely the strangest item I tried, although I'd strongly caution others not to eat too many at the same time. If you're okay with paying a premium to elevate your dining experience, the Special Platter (+$39) is a must - the highlight of which is undoubtedly the Wagyu short rib. 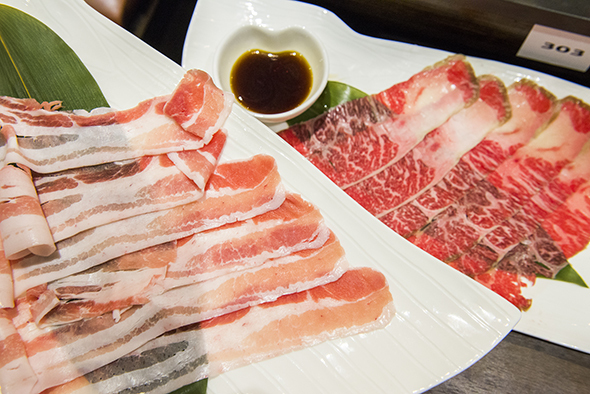 With a good amount of buttery fat, these perfectly marbled slices are outstanding and worthy of the high price point. 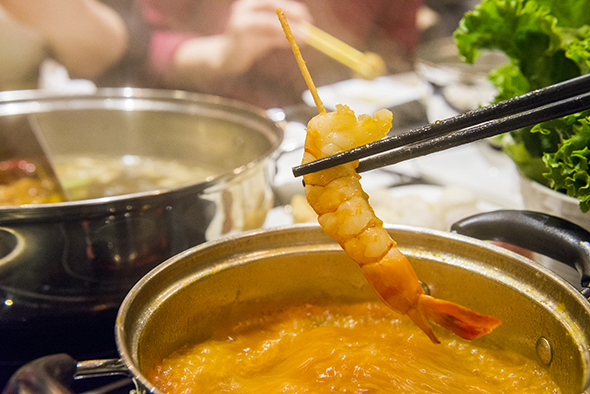 Part of the hot pot experience is having lots of dipping sauces at your disposal. 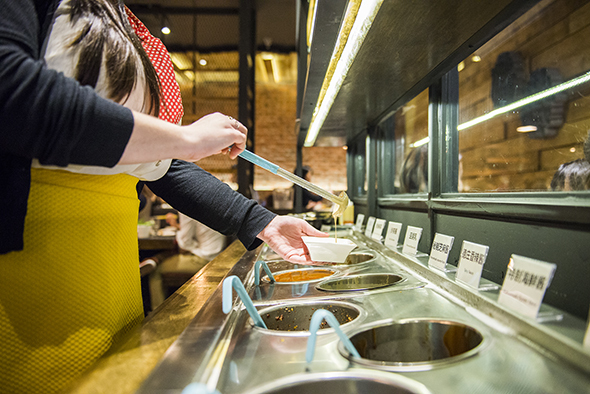 Morals Village has a mix-and-match sauce station that boasts an impressive number of possibilities. 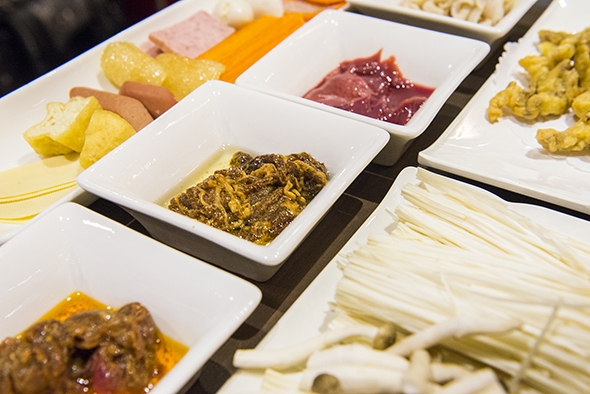 The station also comes with side dishes including as much fried bread (mantou), spring rolls, Chinese sausages and Enoki mushrooms as you want. Win. In between all the heat emanating from the food, we cooled our tastebuds by sipping on watermelon and kiwi juices ($5.99). The dessert, featuring vanilla ice cream made on-site, is unexpectedly amazing. 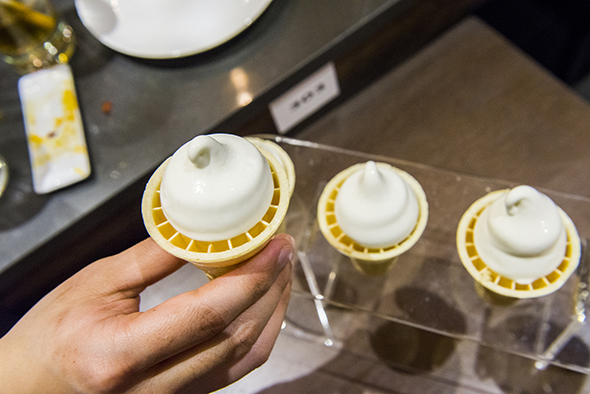 One of the richest and creamiest soft-serve ice creams I've ever had, it was the perfect end to a scorchingly hot and steamy meal. Posted by Darren "DKLo" Susilo. When not writing for blogTO he can usually be found tweeting here or pressing words into this blog .